The rich history of Wayanad dates back to the rule of Vedar Rajas followed by Kerala Varma Pazhassi Raja of Kottayam, who fought the British valiantly. Developed as a district in 1980, this region is concentrated with tribal communities Adivasi population here is a mix of Paniyas, Kurumas, Adiyars, Kurichyas, Ooralis, Kadans, and Kattunaikkans. Named after its vast expanse of paddy fields Vayal Naadu, Wayanad sits cozily nestled among the Western Ghats and borders Kerala – God’s own country – in the North. Located on the southern tip of Deccan Plateau, this place is deeply rooted in its civilization that dates back to at least 10 centuries before Christ. Archaeological evidence reveals traces of human settlements as early as the 18th century with hints of new Stone Age civilization that can be seen throughout the present day Wayanad district. This green forest land is abundantly blessed with rich cash crops – pepper, coffee, cardamom, green ginger, rubber – making it the most sought after district by migrants to exploit this veritable goldmine. This region is the biggest foreign exchange earner in the state. Unlike other districts of Kerala, Wayanad is no city or town, but an amalgam of three municipal towns, Kalpetta (Vythiri), Mananthavady and Sulthan Bathery. This region enjoys salubrious weather all through the year. The best time to visit here would be from October to May when the weather would be cool and pleasant. Mysore Airport is 87 km away from Wayanad. Kozhikode Railway Station is 61 km away. A spot made famous by silver screen, Thamarassery is a must-see place for shutterbugs. Strategically placed on the Calicut – Wayanad – Mysore highway, Thamarassery is easily accessible to road lovers. An added bonus is the hill highway that bends and twists and turns revealing the breath-taking beauty of nature at every turn. While at the drive, don’t miss the Thusharagiri Falls that creates the mystic snowy spray as the Challippuzha River drops from an altitude of a cool 75 meters as the Thenpara Falls. Proclaimed as the 195th largest urban area in the World, Kozhikode is dubbed the City of Spices. First explored by Vasco Da Gama in the year 1498, Kozhikode then opened the trade route between Malabar and Europe. With a rich and ancient cultural history and heritage, tourists can also take a glimpse at the City of Sculptures. Treat your taste buds to the World-renowned cuisine of Kozhikode that has influences of Portuguese, Dutch, French, British, and Arab. Experience the royal heritage of Mysuru, the Cultural capital of Karnataka, that is dotted with splendid palaces taking you back in the time of horse-driven carriages and valiant kings. Drenched in the sweet sandal scent and indulge in the soft Mysore silk, this is one city which you can keep wanting for more. The modern Mercara, which goes by its old name of Madikeri, lies in the Coorg region of Karnataka and is a scenic hill town. Travelers can visit the Madikeri Fort, St. Mark’s Church and the Omkareshwara temple. One can also visit the stunning Abbey Falls and the viewpoint of Raja’s Seat which offers stunning views of the forests and the valley. Palakkad is famously known as the ‘Gateway of Kerala’ due to the presence of the Palakkad Gap, which lies between the Anaimalai and Nilgiri ranges. The city is known for its paddy and rice fields and is also known as Kerala’s ‘Rice Bowl’. Travelers can visit the Malampuzha Rock Garden and Dam, Tipu Sultan’s Fort, the Seethargundu viewpoint, the Kalpathy temple and Palakkad Fort, and the Parambikulam Wildlife Sanctuary. The 5000-yr old town of Guruvayur is known for the popular pilgrimage site of the Shree Krishna Temple, which is known for a 33 meter-tall gold-plated Dwajastambham and a 7 meter-high Deepastambham. The temple is the country’s fourth largest temple in terms of numbers of devotees who throng the place. Also visit the Punnathurkotta elephant sanctuary, where elephants have been revered for decades. 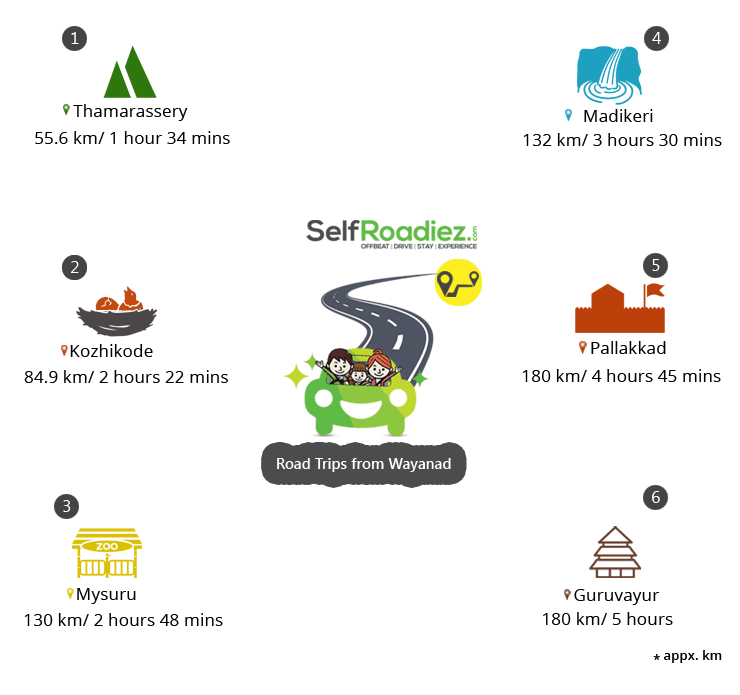 Driving around Wayanad itself is a sheer delightful experience as the ghat roads twist and turn, taking you right into the paradise on earth. Frenzy road lovers can head out to the Banasura Sagar Dam, impounding the Karamanathodu tributary of Kabini River. Supporting the Kakkayam Hydro Electric Power project is the majestic Banasura Sagar Dam, the largest earthen dam in India and second largest in Asia. Named after Banasura, son of the famous King Mahabali of Kerala, it is India’s First Solar Atop Dam. Soak in the freshness of Pookode Lake, a serene natural freshwater lake resting a top 770 meters above sea level. Pookode is not only the source of Panamaram, the rivulet which becomes Kabini River, is also the home of Pethia Pookodensis, a cyprinid species fish unique to this lake. Standing majestically is the Chembra Peak, the highest in Wayanad at a whopping 2050 meters. 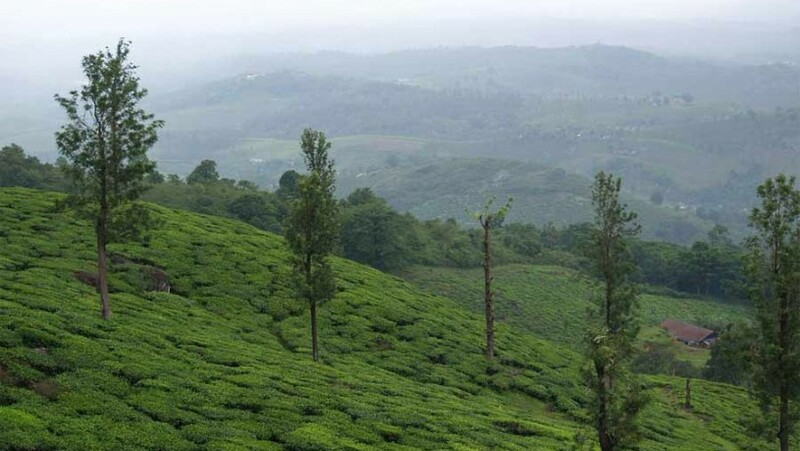 Perfect for die-hard trekkers, the rolling hills and green cover provide the best scenic spots for nature lovers. A heart-shaped lake that is believed to have never dried up is located halfway up the hill which takes a good 3 hours to trek. The naturally formed Edakkal Cave is the next pit-stop for tourists with its sheer profundity of almost 30 ft.
Wayanad is honeymooners’ heaven and complementing this characteristic are the sprawling resorts that have been strategically developed in and around nature. Home-stays are the latest attractions that are pulling in more crowds from across the world to this paradise on earth. The backdrop of the stunning Banasura Hills creates an enchanting scenic arena around this Retreat. Overlooking a sprawling tea garden, this property is blessed with a sparkling river flowing enthusiastically by its side. Three acres of coffee, areca nut, and pepper plantations that encompass the beautiful cottages creating a cozy nook for the perfect getaway from the hustle and bustle of modern lifestyles. The accommodations are air-conditioned, Swiss tents that ooze luxury and comfort. The interiors are decked up with stylish yet soothing contemporary furnishings. The ceilings are covered in cloth cabanas that recreate a typical tent ambiance. Immaculately kept rooms and extravagant bathrooms will pamper you in the lap of nature in luxury. This beautiful resort bundled up in the blankets of the Banasura Hills in Vythiri is a hill station that falls in the Wayanad district of Kerala. It is one of the most beautiful places in Kerala, with many spice plantations as well as tea and coffee estates that make it a perfect retreat to rewind and rejuvenate. The Resort is beautifully done keeping in mind the city-dweller – a home away from home in the true sense! This stay gives you plenty of opportunities to experience nature without your luxuries being curtailed. This resort tucked away in the heart of Wayanad, has eight independent cottages with a beautiful view of the majestic Banasura Hills. This temple of tranquility offers enchanting views of Wayanad and its picturesque hills. This Homestay is encompassed by 30 acres of farms which include spices like pepper. The aroma of the pristine air of this piece of land can be incredibly rejuvenating. This leisure homestay consists of a bungalow and charming wooden hut accommodations atop a mesmerizing hill. The rooms, with all modern amenities to pamper you in the lap of luxury and nature, are immaculately kept. The tones of gold and amber on the walls resonate calming magic and ooze homely ambiance. Wayanad’s stunning and rolling tea plantations, sparkling waterfalls, rich wildlife, the many tributaries of the Kabini River, and splendid weather had prompted many Europeans to set up retreats in this mesmerizing land. Amidst such breathtaking settings, tucked into a lush tea garden is this sprawling plantation estate, a property with two beautiful bungalows constructed a century ago by the British. After acquiring these huge bungalows, the plantation owners conserved and customized them to offer a luxurious experience to their guests, preserving the architecture and essence of a bygone era. Uninhabited and least explored, Kuruva Dweep, a protected river delta, is the perfect getaway for trekkers who love to trench into the unknown. The coracle ride along the Kabini River twisting and turning amidst this cluster of evergreen forest islands is truly a thrilling experience. With restricted entry during the monsoons, October to May is the best time this 950 acres of grand green cover a protected river delta. Do pay homage to the Chain Tree for a safe passage on the Ghat Road as it is believed that the spirit of a tribal youth is captured and chained to it. An English engineer who wanted information on accessibility to Vythiri took the help of a tribal youth and completed the ghat road as we see today. But after getting help, they killed the tribal youth whose spirit is believed to haunt and kill many road users. Local priests took the initiative and chained the spirit of the tribal youth to this Chain Tree creating the legend. Wayanad is one beautiful holiday that weaves its magic right from the time we step into the soil. This is one place where one can make beautiful memories and hope to come back again and again.